Only icicles are for real? A kayak in the skies, three wandering sled dogs roaming free, the dog master pushing his sled, and two mighty polar bears nudging a tiny red fish: Where is Alaskan wintry realism in this nativity set? From the beginning representations and descriptions of the nativity paint a world upside down, a moment of awe and wonder, nature losing its grip. In one of the first descriptions of Jesus’ birth, Joseph experiences nature, heaven and earth, animals and people, coming to complete standstill (Protogospel of James, 18). The nativity suggests a new realism, the realism of the marriage of heaven and earth. It must be… because not even the icicles in this nativity are real. Set is made of planed wood and painted. Exhibition label written by Fr. Johann G. Roten, S.M. 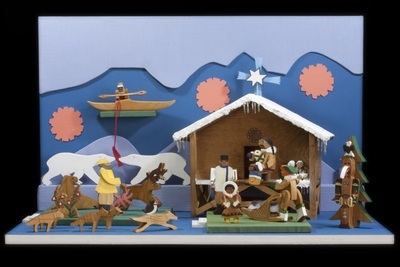 originally for exhibit entitled "Elisabeth's Nativity House: The van Mullekom Collection" held at Roesch Library, University of Dayton.